Here’s the situation. I own three cars: my BMW daily driver, the family workhorse minivan and my project car, pictured above (it’s the only picture I presently have). 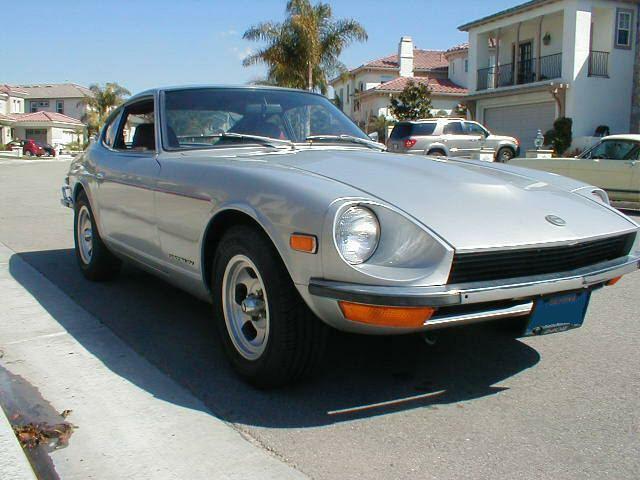 It’s a 1972 Datsun 240Z. And it resides in my parents’ garage, 90 minutes away. My dad bought it new in ’72, and gave me the keys as a college graduation present in late ’01. It’s something of a family heirloom, so selling it is out of the question. Part of the reason he gave me the keys was that I enjoyed working on it so much. Before the passing of the baton, I’d taught myself to rebuild and synchronize the twin SU carburetors, adjust the valve clearances, and do a full tuneup. I’d replaced both the brake and clutch master cylinders as well as the rear drum brake cylinders, and removed the ancient and inoperative dealer-installed A/C system. I love tinkering with the old 2.4l SOHC inline-6, and the car’s electrical system wiring diagram spans, in its entirety, a whopping two pages—meaning the car’s electrical system is admirably simple to diagnose and fix. And not made by Lucas. The car needs a full down-to-the-metal restoration. The passenger side floor pan is rusted through, the battery tray is eaten away, the firewall has holes in it, and I can push my finger through what’s left of the rocker panels. It’s pretty far gone, and my only reason to think the car isn’t destined for the scrap heap is the fact that I’ve seen 240Zs completely restored from being even farther gone than mine is. The body style was popular in its day, had a long 8-year model run, and replacement panels are readily available. And I have faith in miracle-working powers of good body men. The engine quite possibly needs an overhaul, if not total rebuild. Some years ago, due to a combination of circumstances, I ran the engine with zero oil pressure for about 3-4 minutes, and it’s never been quite the same since. If nothing else, it probably needs the mains replaced and cylinder bores honed. Of course, none of this is terribly difficult with the engine out of the car, which it will be during the body’s restoration. Keep it as stock as possible. Given that, as noted above, the car is something of an heirloom, there’s a certain appeal in leaving the car “numbers matching,” or at least ensuring the body’s and engine block’s serial numbers match up, even if I do install some aftermarket bits like headers or uprated suspension and wheels. 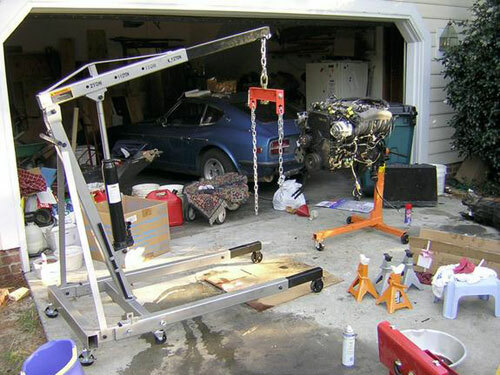 Install an L28 (2.8l iteration of the 240Z’s engine) with either triple Weber carbs, or keeping the stock SUs. Click here to view an example of that combination in action. The power bump over the L24 would be healthy, and the setup wouldn’t have the complexity of a turbo, but would have the downside that the engine wouldn’t be original to the car. Drop in and tune an L28ET, the factory turbocharged version of the Datsun/Nissan L-series engine. Here’s an excellent video of that setup. It’s a fairly straightforward swap; the motor mounts and drivetrain bits match up, the only custom fabrication required would be the engine management and peripherals like the exhaust and intake piping. Go nuts and install a completely different engine, like a small-block Chevy V8, SR20DET (Nissan 4-cylinder turbo), RB25DET (Nissan 6-cylinder turbo), 1JZ-GTE (Toyota 6-cylinder turbo) or Mazda rotary (not sure if this has ever been done). Advantages include the cool/interest factor and power potential; challenges are legion and include just about everything you can imagine, from sourcing an engine in the first place to all the custom adaptation required. Any thoughts? I’m leaning toward Project Path No.1, but the lure of boost is difficult to resist. Whatever the case, when the car finally arrives and I begin tearing into it, barring any “unforeseen acquisitions,” the Z will officially be the first Spannerhead.com Project Car™. Stay tuned. Having had experience with both small turbo charged engines and the small block chevy engine, my first thought is STAY AWAY FROM #4!!! I can think of quite a few reasons for this, including 1) lots of fabrication equals lots of extra time and money spent on an already comprehensive project, 2) you set yourself up for unique problems that require unique (rare, expensive, hard to find or install) solutions, 3) I am not an expert on the Z car, but I would doubt that the chassis could support a major increase in hp, and any amount of extra weight would certainly detract from the handling/fun factor, and 4) you may never complete the project (I have a certain Supra 1JZ-GTE project in mind). You know that I am a big advocate of more power. But I am also a big advocate for actually completing and spending time behind the wheel of a project car. I have seen far too many cars that were amazing concepts but never saw any real time on the road because the owner’s vision was too broad and lofty. I have also learned (after many years experience) that no car can do it all. You have to have a specific stated purpose for each project and the closer that purpose is to the inherent strengths of that car, the easier/faster/cheaper the project will be. The 240 is not a muscle car and a copious amount of power would be wasted on it as it is not designed in such a way to put that power to the ground (suspension, tires, weight distribution, etc). The 240 is a very light car that, I would imagine, handles like a go cart and looks good doing so. I would say the first priority would be to preserve these traits, adding other things (like power) in moderation. Forced induction always adds another element of complexity to an engine. As much as I love the sound and pull of a turbo charged engine, I don’t think it’s worth the maintenance and wear…and it’s not really needed in a car as light as the Z anyway. Whatever it is you decide to do, have fun doing it and have a reasonable time frame for completion before you begin. Starting an open ended project never goes well…even for those who don’t have a family to consider. And I want to see this done. I think it’s a beautiful car that needs to be driven. So whatever help you to that end is worth it. :) No worries about the long reply. As always, some good observations in there. I agree that #1 or maaaybe #2 is probably the way to go. I get overwhelmed just thinking about restoring the thing—forget adding big power. Perhaps if I were starting with a car that was already “at 100%,” or close to it, it would be easier to contemplate a big power project. But as it is, it’s going to take crazy amounts of time and resources just to get the car back to stock. I’m always a proponent of more HP (typical Mustang guy, lol). But in all seriousness, I think fun-factor for the dollar/time spent your best bet would be option #3, as long as the tuning of the turbo setup is not overly complicated. Best of luck and I look forward to seeing how your project progresses. Thanks for the comment (and compliment!). I’ve seen that Z…it’s stupid fast. It’s amazing what the early Z-car engine bay will hold. I can attest to the fact that with the stock L24, there’s literally enough room for me to stand beside it in the engine bay (if I’m on the passenger side, at least). Thanks again for the well-wishes. Will definitely keep you guys updated. First order of business: Getting the car into my own garage, haha. My vote is for #1. The only other thing I’d add to your to do list is to return the paint color to be the original orange. …Could make it more of a magnet for police radars though. Orange is the iconic early Z color (and even the first color the 350Z was offered in, as an homage), though, so it’s easy to make the mistake. Hahaha, you’re right. I don’t know why I had “orange” in my head as the original paint color. I only ever remember it being its current color of blue. Good luck and have fun! My vote is for number 1. Once it’s been taken to the dark side and modified, there’s no going back.